Another storm is on the horizon. The aptly named Athena is tumbling towards Baltimore threatening to envelop the northeast coast in snow, rain, and heavy winds just days after Sandy devastated much of the region. Fortunately, Sandy spared my little spot on earth and I’m gleefully anticipating a thin blanket of snow covering the fallen leaves in my messy garden. Nothing looks more beautiful than a freshly white landscape. Let’s just hope the power stays on, the tides stay back, and Athena passes through as calmly as she can. Speaking of devastation, I totally demolished this salad in one sitting (yeah, I just did that). This salad is best served while the butternut squash is still hot from the oven, and the dressing is warm from the pan. I brought a double batch to the “election day” pot luck at work today and every morsel was eaten. It turns out the best way to celebrate a presidential election is to stuff everyone’s faces with food so they can’t discuss politics. Roasted butternut squash salad with warm apple cider dressing can help you celebrate a victory or drown your sorrows. Either way, it’s delish. I managed to talk about the weather, the election and salad all in two paragraphs. Victory is mine. Place the butternut squash on a sheet pan. Drizzle with 2 tablespoons olive oil, the maple syrup, 1 teaspoon salt and 1/2 teaspoon pepper and toss. Roast the squash for 15 to 20 minutes, turning once, until tender. Turn on broiler to brown quickly; about 2 minutes. While the squash is roasting, combine the apple cider, vinegar, and shallots in a small saucepan and bring to a boil over medium-high heat. Cook for 6 to 8 minutes, until the cider is reduced to about 1/2 cup. Turn off the heat, whisk in the mustard, 1/4 cup olive oil, 1 teaspoon salt, and 1/2 teaspoon of pepper. Place the arugula and spinach in a large salad bowl. Spoon just enough of the dressing to moisten the greens and toss well. Add the roasted squash mixture, the walnuts, and the cranberries. Drizzle with dressing (No need to toss. I find the butternut squash breaks up too much and it is prettier layered). Serve immediately. "...stuff everyone’s faces with food so they can’t discuss politics" ??!! I LoLed! That is the kind of thinking we need in Washington. There would be no more "reaching across the aisle", that would be rude. From now on it will be "passing across the aisle"! "Public Service" takes on a whole new meaning and would likely include flatware and glassware. Grubarazzi for President 2016!! Your symbol? That one writes itself, a black napkin with a crossed knife and fork. yeah and this recipe sounds great too. Good luck with Athena. What a lovely salad and I love the bright dressing you paired it with.... yes... I would definitely eat an entire bowl of it too. :) Hope you only get a dusting of pretty snow... nothing to overwhelming. :) Take care. That just screams fall, yummy! I am completely impressed with the ground you covered in 2 paragraphs. And I would demolish that salad a way that would make me embarrassed if others saw. sweet squash and peppery arugula, for the win. Sandy has nothing on me. Lovely salad. Stay safe there! I'm glad you were spared from the wrath of Sandy! Loving this salad...definitely the epitome of autumn! YUM! Have a great weekend! What a beautiful and delicious salad! I love your roasted butternut squash salad! The color is so pretty and apple cider dressing sounds very refreshing! And stay warm! This sounds delicious! I used to make a similar salad and I would make a meal of it. Squash is one of my favorite things in the world! I love that you have pot lucks for election day and I want a job right now please :) Fantastic looking salad which I'd vote for.. 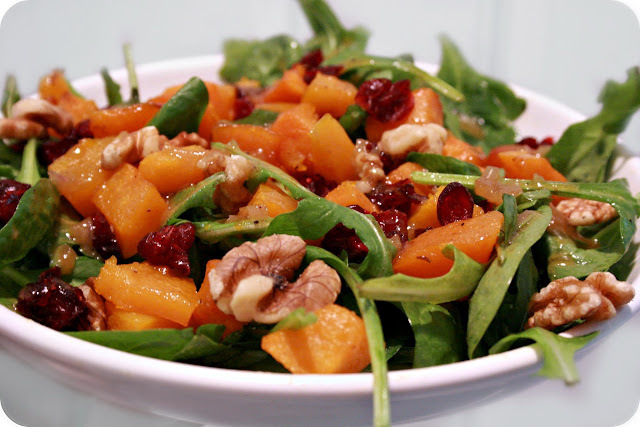 Your salad looks so good, I love roasted butternut squash, so sweet and testy! Oh my this salad looks divine! What a fabulous combo!